I recently received two varieties of Cinnabon cereal in the mail. The first one I tried was Cinnabon Cinnamon Crunch. I found that cereal to be somewhat boring. While the box seemed to promise a sweet, fun cinnamon-roll-esque flavor experience, the cereal turned out to be anything but sweet and fun. You can read the review here. The Caramel Pecan Crunch variety is a little bit better than it's Cinnamon counterpart, but it suffers from the same shortcomings. The cinnamon flavor tastes burnt. The cereal pieces taste a little too much like wheat. It's difficult to describe the cinnamon flavor. Imagine eating a cereal and getting a slightly burn-cinnamon aftertaste. Now image that the burnt aftertaste is the main flavoring of a cereal. 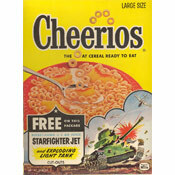 That would be this cereal. It's the pecans that make this cereal just a little bit better than it's Cinnamon brother. There aren't many pecans, but the occasional spoonful where you recognize them are the best spoonfuls. For what it's worth, this cereal smells a lot better than the other variety. You open the box and get a bakery aroma that might even remind you of a Cinnabon stand. Unfortunately the taste doesn't deliver on the odor. To it's credit, this cereal stays crunchy in milk and it's nutritional profile isn't too bad. This is simple case of "don't let the box fool you". While not entirely horrible, this cereal is nothing like the nutty glazed sweet rolls on the box. 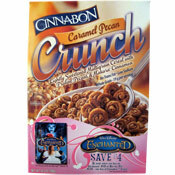 The $0.00 dollar amount paid is because the cereal was sent to MrBreakfast.com by the company..
What do you think of Cinnabon Caramel Pecan Crunch? Oh my God I love this stuff but can't find it anywhere. This is the first honest review I've read. After buying my first box, I discovered the box might even taste better than the contents. How can a company that obviously knows cinnamon produce such terrible awful product? Boring is putting it nicely. Tastes like it was concocted by food scientists and marketers, and someone forgot to actually taste this crap. I bought the cereal this morning and was so disappointed. I called the 800 number on the box, and they're sending me a refund. Not worth the $4.69 I spent. Not even worth $2.00. It had too much cinnamon,it wasn't sweet and had an aftertaste. HORRIBLE!!! I recently bought this Cinnabon Cinnamon Crunch cereal thinking this would be very tasty. It turns out you can hardly taste any cinnamon at all and also it tasted like I was eating cardboard. I really don't like the taste of cardboard. It also tasted like it had been in the snack machine for 2 years. How could it get any worse. I will never ever buy this cereal again.